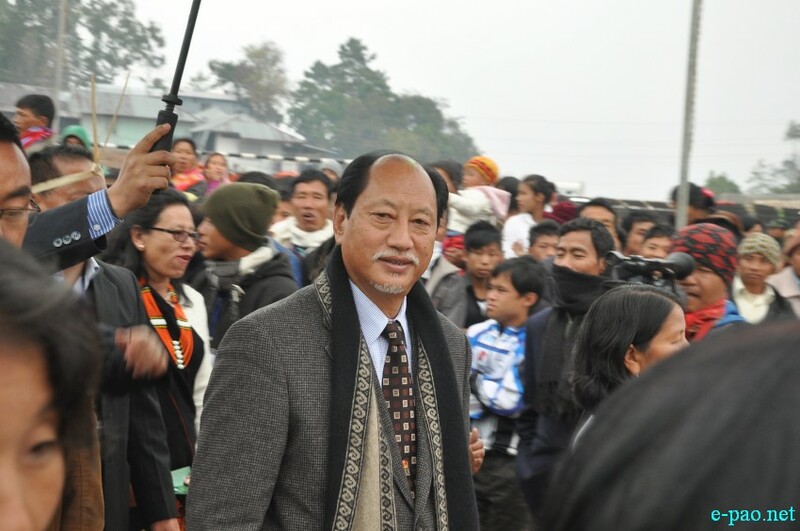 Ever since the rumor of Nagaland Chief Minister Neiphiu Rio's desire to go to Delhi as an MP from the State broke out, many started studying on his political activities. Some political mild tremors have been going on for quite some time and almost all the NPF legislators in the State have also made their best efforts to reconsider his decision to go to Delhi as an MP from Nagaland. But all their attempts, reportedly, failed and it is now almost clear that he is going as a Nagaland MP to Delhi. This unusual political development has thrown split opinions among the ruling political circles as to who would succeed him in the event of his departure from the State politics as an MP. Because one has to step in to lead the DAN-III Ministry. Some of the senior Ministers namely TR Zeliang, G Kaito Aye, Noke Konyak have been seen as main contenders in the race for CM's post. It is, however, reported that Noke Konyak is not interested for the top job. Talks are also reportedly doing the round that NPF President Dr Shurhozelie might be approached to take the baton from Rio if the leadership crisis is not resolved. But in the past also, some NPF legislators allegedly approached the NPF supremo to run the Government. But he reportedly turned down the idea. It may be mentioned that then Nagaland People's Council (NPC) leader late Vamuzo, who was not an MLA then, also became Chief Minister of regional party in Nagaland in 1990. In the House of 60 in Nagaland, the NPF legislators including the Chief Minister and the Assembly Speaker, Chotisuh Sazo, are 38. So if the Chief Minister goes to Delhi as an MP and without the Assembly Speaker, the NPF legislators will be 36 and these legislators (36 NPF) will have to decide who will be their next legislature party leader. And any legislator elected as their legislature party leader from amongst them will be their next Chief Minister. Whether one likes it or not, formation of any Government in any given crucial period is a number-game as the one who gets more legislators in his side automatically becomes leader. After all it is a democracy. If there is consensus, the problem ends. But if there are contenders for the leadership of the NPF legislature party, they have to go for votes and who get more legislators becomes their leader. If one looks at the fast emerging trend as the NPF party is going to sit to formally endorse the candidature of Chief Minister Rio as the official NPF candidate from the State for the upcoming Lok Sabha elections, uncertain political wind has already started blowing and many seemed to be floating unknowing whom to support in case there is a contest for the leadership of the NPF legislature party. But looking at the imminent unpredictable political scenario, the NPF legislators may study various factors including the stalled Naga political process between the Government of India and the Naga underground leaders before zeroing in on any one to be their next legislature party leader to become the next Chief Minister of Nagaland. The State is still having many issues and they are yet to be addressed. The future is bleak. Unemployment has increased and likely to increase manifold. Our economy will have a nosedive as the State's finances are not seen improving. We can still remember how the last State Annual Plan Size was finalized. In fact, over the last few years, no major developmental activities did take place in the State. There is hardly any visible sign of improvement in many sectors. They remain the same if not worse. In the political front, in spite of Rio's ruling for the last 11 years, no significant progress in the Indo-Naga political process was seen. Unfortunately, no party, whether it is the State Government or Delhi or NSCN (IM) leaders, can make the status of the Indo-Naga talks public even after 17 years of peace process. In fact, the tempo of the Indo-Naga political process is fast waning. The Government of India's failure to even appoint new interlocutor for the resumption of moribund talks with the NSCN (IM) itself is a sign of weakness. The State has also witnessed the emergence of a new State Civil Body as Nagaland Tribal Council (NTC). Over the last few years, ENPO, the apex body for districts of Tuensang, Mon, Longlen and Kiphire, has even gone to the extent of demanding a full-fledged statehood of "Frontier Nagaland." After this movement, they seemed to be growing stronger and united. There are also some talks doing the round like Tenyide factor, ENPO factor, etc. coming in while searching new NPF legislature party leader. But such issues may not have any impact as many leaders had already experienced that such a bloc hardly worked except bringing more divisions. If there is no consensus, let there be free and fair election for the post of NPF legislature party leader and the outcome should be supported by all. These are some of the issues confronting us and the new Chief Minister whoever may be should be able to handle them with a fine equation. Let us see the district-wise NPF legislators: Kohima – 6 NPF; Dimapur – 2 NPF; Peren – 2 NPF; Wokha – 1 NPF; Phek – 5 NPF; Zunheboto – 4 NPF; Mokokchung – 5 NPF; Mon – 6; Tuensang – 4; Kiphire – 2 and Longlen – 1. Things are still vague the way Rio expressed his desire to go to Delhi as an MP because we have a slim chance to play any important role in the Parliament. In fact, it would have been nice if he had some formal or informal consultations with the leaders of DAN allies like BJP and JD (U). Both the allies have one MLA each. NCP, which is also having 4 MLAs, supports the DAN Government. The current Lok Sabha electioneering wave across the country appears to be giving more weight to the BJP led by its dynamic Prime Ministerial candidate Narendra Modi. The country is heading for a hung Parliament, though the BJP is likely to emerge as the single largest political party in the event of the Lok Sabha elections. The North East Regional Political Front (NERPF) with Rio as its leader is unlikely to have any impact on the forthcoming Lok Sabha elections in the region. In any case, a NPF MP is hardly seen any factor to the would-be post-poll BJP-led NDA scenario. The only factor is the Central BJP leaders may not ignore Rio as he has been seen as a strong anti-Congress stalwart in the region, besides his Christian background. Surprisingly, the Naga issue has not come at the center stage in the current electioneering waves. It's very interesting indeed.